A pic of 733 Broadway from early February. + 733 Broadway has been in the works for a long time, going back a decade in some form or other. 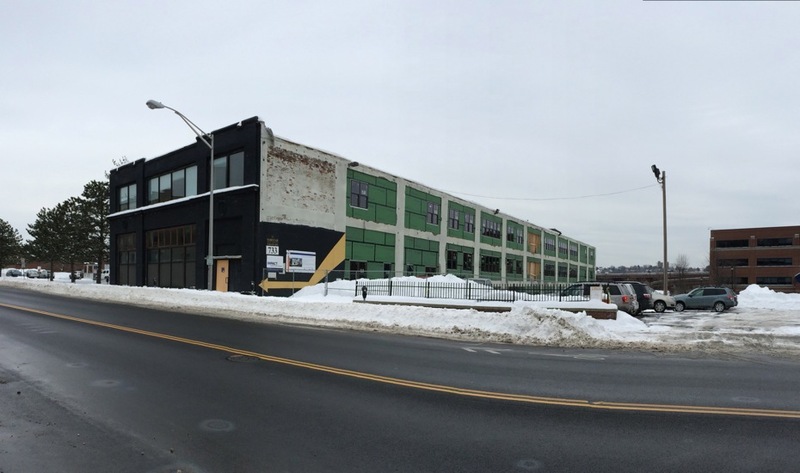 + It's another bit in the ongoing residential transformation of downtown Albany. So we were curious to find out what's up with it. Norstar Development is converting 733 Broadway into 29 apartments (about 44,000 square feet all together), with approximately 3,800 square feet of retail and office space on the first floor. 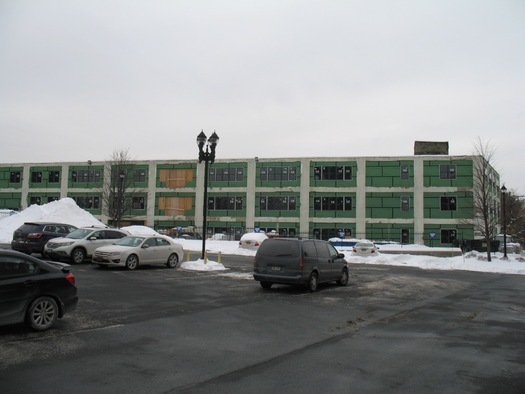 The retail/office space is projected to be ready by May, and the apartments by August, Norstar development assistant Kristina Higgins told us this week. The 29 apartments will include 23 1BR (747-1080 square feet) and 6 2BR (1179-1251 square feet). Higgins said rents are expected to range from $1,200 to $1,800. Rent includes a parking space (the building will have about 60 parking spaces), and there will be washers and dryers in the unit. The building will also have a fitness room and tenant storage space. Higgins described the apartments as loft-style -- big windows, high ceilings, open layouts. And following the shape of the building, she said they're like railroad flats, thinner and longer. The building dates back to 1950, according to city tax records records, and it once served as a plumbing supply showroom and warehouse, and then later as offices for the state Department of Health. Said Higgins of the building style: "We went with it, we embraced the old warehouse aspect of it." Norstar is planning to split the retail/office space -- one part for its own office, the other 1700 square feet for what it hopes to be a retail or restaurant tenant. "We're hoping to get someone in [the retail space] to bring continuity to that part of Broadway," Higgins told us. 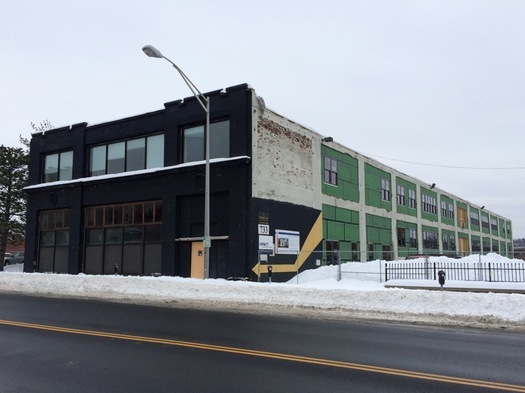 She said the company sees the project as potentially contributing to a connection between the north side of downtown Albany and the fermenting development in the Warehouse District just to the north. 733 Broadway as view from Spencer Street. Higgins said Norstar is aiming to have a model apartment ready by this May, and it will be pre-leasing apartments. She said the company has already received a few calls from people interested in renting. + It won't be the site of the Albany convention center, so what will it be? How do these developers expect to fill the units when they are charging over $1,000!? I dont understand this market. I am a young professional who would love to live in these new apartments popping up but jesus, I couldn't afford rent over $800 per month with my student loan payments and everything else! Cool. Glad something is finally happening there. $1200 includes a parking space. I wonder if I could rent out that parking space for, say, $200/month. Exciting but mediocre to look at. Wishing something more progressive could've been done with the space around the building and with the design. What I'd love to see incorporated into these apartment complexes is garden space. Whether it's roof top or part of the green space, it would be fabulous to have the option of a small garden plot for flowers or vegetables in addition to the obligatory parking space. I'm glad to see the building being used, but disappointed to see such an uninspired elevation. The proposed building looks like it would be at home on Corporate Woods Blvd. Wish the developer had hired an architect with some real design chops. Agree that the design of the building is very boring and looks right out of the new Albany Med development. BUT, it's great that this is actually happening after years of delays. A good first step.I agree that the building design is mundane, but housing there is definitely an improvement. There are so many parking lots in this section of downtown, and those surface lots should be developed with the parking built underground. Finally, is anything going to happen at the much larger vacant lot next door with the defunct gas station, however? I would think that would be prime real estate. @chrisck - I wonder if you could turn your parking space into a garden. You could put a lot of containers and raised plots in the average parking space, to say nothing of stacking vertically. Is anyone else looking at this and just shaking their head? Albany can build all the apts, and condo's it wants, but with nothing serious to draw anyone down to the area, what good is it? I'm amazed at the lofty opinion Albany has of itself and how little it delivers. $1000 a mo. isn't outrageous. Take for example the comparable Monroe, a high end building - also a gut rehab of former industrial space provided assistance by the City IDA. The Monroe has enjoyed a near 100% occupancy since its completion. Affordable if people working in area want to share apt.